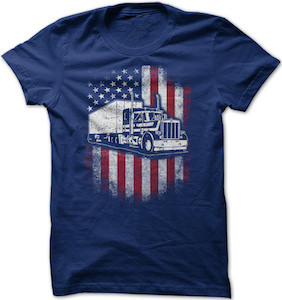 This t-shirt shows the American flag in the background and a truck on top of that and that makes this the perfect trucker t-shirt. You can get this t-shirt in dark blue and black and both have a worn looking image on it. Of course the Stars and Stripes flag of the United States Of America works great on the shirt specially with the white truck on top of it. If you like truckers or are one yourself then this shirt is what to wear. You can get this men’s t-shirt in sizes Small – 5XL and they are all made from 100% cotton for that perfect fit and feel.